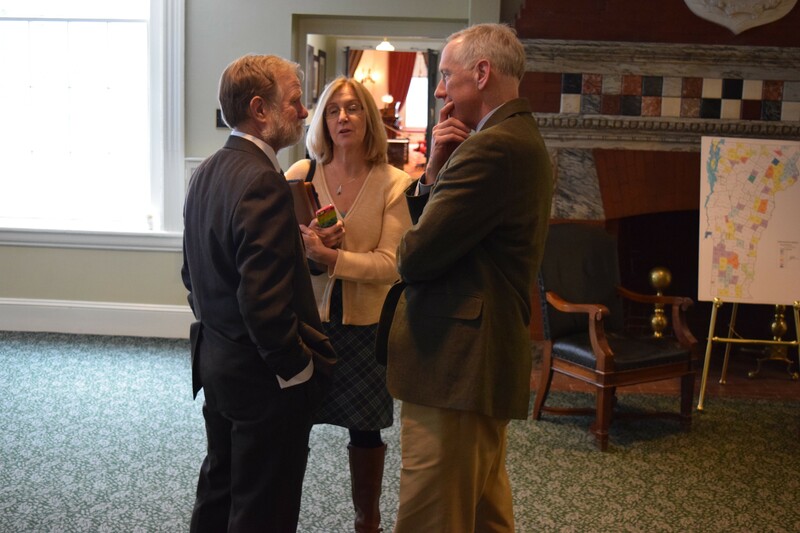 House Education Committee Chair Dave Sharpe (D-Bristol), left, talks with Vermont National Education Association president Martha Allen and general counsel Jeff Fannon. Last October, after failing to reach an agreement on a new contract with the school board, South Burlington teachers went on strike. Schools closed. Parents had to make other arrangements for their children. After five days of that, the school board and teachers settled on a contract. But before the strike ended, Gov. Peter Shumlin and others suggested that perhaps it was time for Vermont to outlaw teacher strikes, as many other states do. On Tuesday, lawmakers took a first step in that direction. Over the strenuous objection of teachers, the House Education Committee voted 8-3 for a bill, H.76, that takes away the option to strike, requiring teachers and school boards to keep negotiating if they fail to reach an agreement. Committee chair Dave Sharpe (D-Bristol) was among those voting against the measure. “The balance is shuffled toward the school boards,” Sharpe said. Teachers agree. Martha Allen, president of the Vermont National Education Association, said there have been 26 teacher strikes in Vermont since 1969 — not enough to warrant a change in law. “When teachers go on strike it’s because the school board stops negotiating,” she said. Instead of strikes, Wright’s bill would require school boards and teachers to go to the Vermont Labor Relations Board if they can’t reach an agreement within six months of a contract expiring. If after a year they're unable to reach agreement, penalties start kicking in. Those include raising the district’s tax rate by 1 cent. Wright said neighboring states have similar laws, and teachers there have retained strong negotiating power. Allen said New York's law does not increase local tax rates in the event there's no agreement. House Speaker Shap Smith (D-Morristown) said he’s unsure whether he supports this specific approach, but said it would be “preferable” to make some change in state law to prevent teacher strikes. The bill goes next to the more labor-friendly House General, Housing and Military Affairs Committee. Chair Helen Head (D-South Burlington) said her committee members have been unable to find a satisfactory system for negotiations without a strike option, but will look at Wright's version. Hailing from South Burlington, Head said she recognizes the interest in preventing teacher strikes, but she said the school board there also found the strike proved effective in forcing an agreement. Smith said he expects the bill will survive in some form for a vote by the full House.